« Ultimate Disney Fan Home in Golden Oak at Walt Disney World Fully Revealed!! 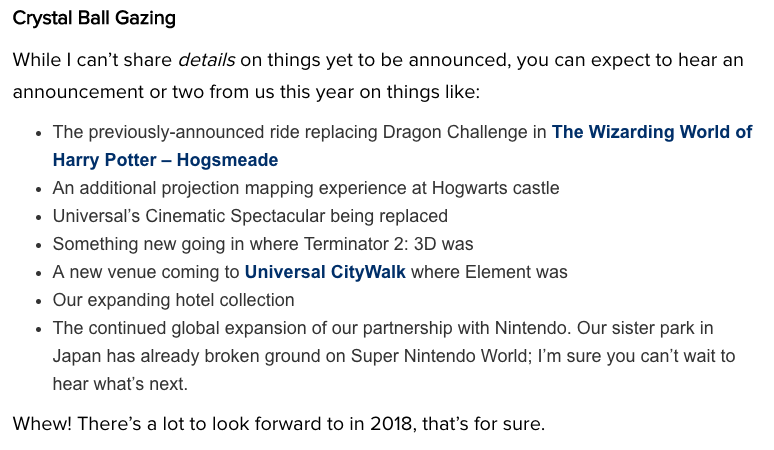 Recently a post on the official Universal Orlando blog about what to look forward to in 2018 caught my eye. Indeed, there are several new projects that we know about that are coming to Universal Orlando Resort this year. The opening of Fast & Furious: Supercharged at Universal Studios Florida, the new Aventura hotel opening near Volcano Bay and of course, Halloween Horror Nights, Mardi Gras, etc. However, it’s the section towards the end of the post that I’m most intrigued about. Gazing into the crystal ball about announcements that will be made in the coming year. The only one that hadn’t been previously announced was the Hogwarts projection show at Islands of Adventure in the Wizarding World of Harry Potter and that’s what we are going to focus on today. The above list provided by the Universal Orlando Resort is actually going to serve as a guide for our own crystal ball series at Theme Park University. Believe it or not, it’s not that hard to figure out most of these announcements through connecting some logical dots about what we already know. Let’s take a look at the Hogwarts projection show at Island’s of Adventure. 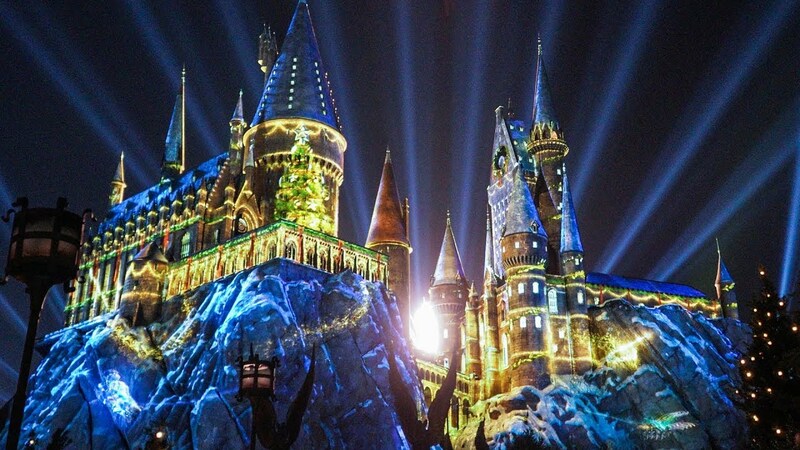 “The Magic of Christmas at Hogwarts” debuted in 2017 as part of a handful of new offerings for the holiday season at Universal Orlando. This show was actually done by the amazingly talented folks at Moment Factory in Canada. If you’ve never seen their other work before click this link, this one and right over here. We are big fans of Moment Factory at Theme Park University. However, “The Magic of Christmas at Hogwarts” isn’t the only show Moment Factory has created for Universal Parks and Resorts. “Nighttime Lights at Hogwarts Castle” debuted in May 2017 at Universal Hollywood in the Wizarding World of Harry Potter. 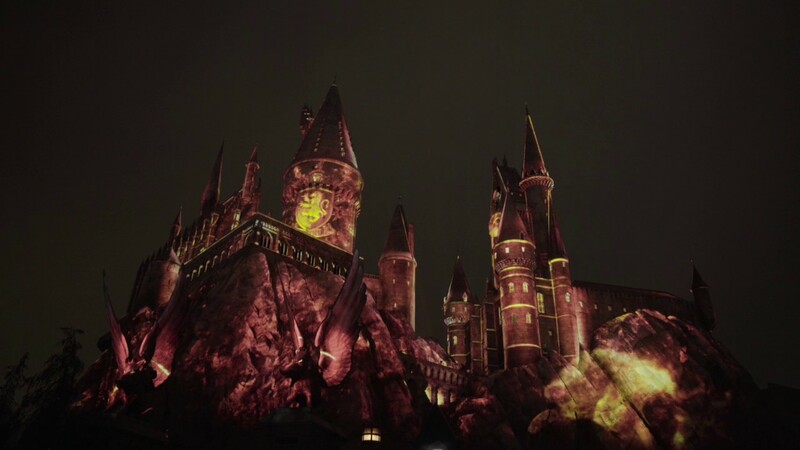 This was actually the first projection show that opened in the United States if you don’t count the events that were held for the grand openings of Hogsmeade in Hollywood and Orlando (which was mostly for press and VIPs).”Nighttime Lights at Hogwarts Castle” is my prediction that Universal Orlando will announce very shortly. The reason being is that it is already created and is an easy addition since the Christmas show went over so well. The cost to create something from scratch isn’t exactly cheap, plus the number of guests who visit the parks on both coasts within the same year is slim. When can you expect to see this announcement? If I was a betting man, I’m going to say it will be a major talking point during the 2018 Celebration of Harry Potter from January 26- 28th. Now I know what you’re thinking, Universal Orlando also has the replacement for Dragon’s Challenge to announce for 2019 as well and we have very few details on it. Not so fast. Theme parks like to give details, concept art and even a more specific timeline after their big project for the current year has opened. Since Fast & Furious Supercharged will not officially open until summer (or on the same weekend as Toy Story Land at Disney’s Hollywood Studios), the odds of many details on the new coaster experience being teased at the Harry Potter Celebration are pretty slim. For now, it’s a waiting game to find out if my prediction comes true for the Hogwarts projection show at Islands of Adventure. Next time? We are going to talk about that “new venue at Citywalk where Element was” that was also teased on the Universal Orlando blog. I’m hungry and am craving a snack. Any of you guys have a sweet tooth? This entry was posted in Universal and tagged Hogwarts projection show, The Magic of Christmas at Hogwarts, Universal Orlando, Wizarding World of Harry Potter. Bookmark the permalink. Trackbacks are closed, but you can post a comment.